A Tiny Vase with a Big Story. ​​The latest of my Polish finds that I want to share with you is something that the seller described as “An art deco vase made in the 1930s by one of the Polish glassworks HORTENSJA”. The marigold vase - shown on the right - was sourced from a Polish dealer, so there was a good chance that their description was correct. However, I couldn’t take anything for granted. Without proof, whatever the seller said could, at best, be regarded as speculation. I had to roll up my sleeves and start digging around. A thorough search of the Hortensja catalogues resulted in plenty of eyestrain, but no matches. Sadly, not every pattern appears in a catalogue, but there were strong indications that it could be Polish and I still had several catalogues to pore over. Also, a negative result proved nothing – it could still be a Hortensja piece and I might never be able to prove it. The next publication on my list was the ‘CHC Katalog’ which was published in 1949 by the ‘Centrala Handlowa Ceramiki’ (aka: Ceramic Trading Centre). The CHC was a state-owned enterprise established in 1948, comprising three stores and based in Warsaw. ​When the catalogue came to light, a few years ago, it turned out to be the equivalent of the ‘Rosetta Stone’ for Carnival Glass collectors. The catalogue was found to contain images of a small sample of the many patterns produced by half a dozen Polish glassworks and, as well as allowing us to attribute makers to a number of ‘mystery’ patterns, it added at least 2 new names to the list of Polish Carnival producers. Above: extract from the 1949 "Centrala Handlowa Ceramiki Katalog". It is only 4.5" tall! Checking the catalogue was a long shot, but it paid off when I reached page 74, because there it was at the top of the page. It wasn’t obvious at first, as the rim was unruffled, but closer examination of the vase showed that it was clearly the same as pattern #2305. The next surprise was the caption, which stated that it was made by Zabkowice, rather than Hortensja. 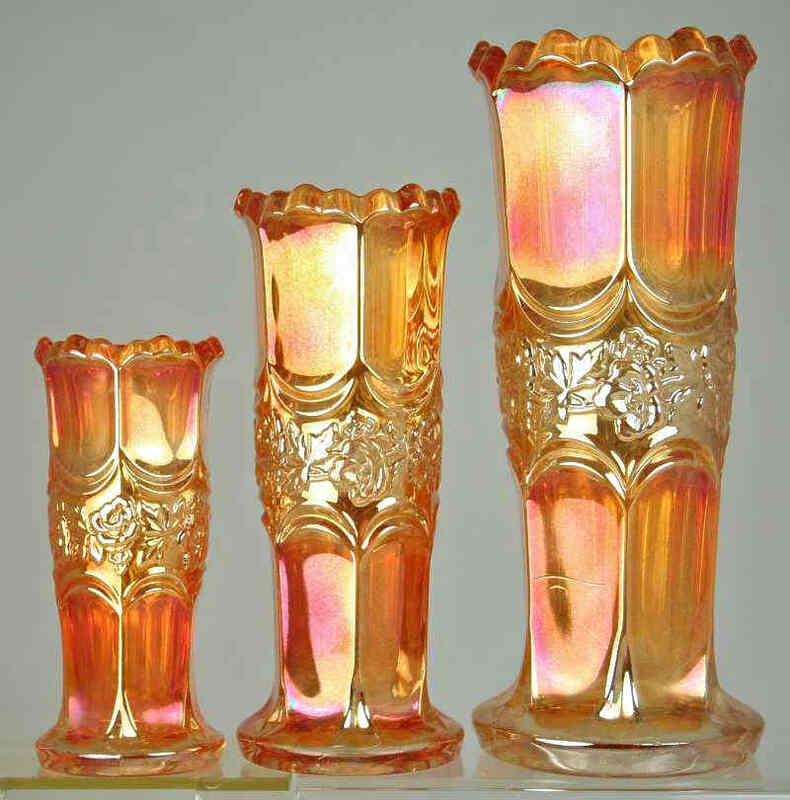 In fact, all four of these vases were made by Zabkowice. ​On the right are close up pictures of the rim and base of my vase: they show that the ribs do not extend up to the very edges of the vase, as in the catalogue line drawing, and clearly show that the ribbing is made up of three grooves and two ribs. ​The final test was to see if it was the right size, as it had to fit within a range of 80 to 200mm. The vase measured 115mm (4.5” in old money) – which is right in the middle of the permitted range as indicated in the catalogue. In fact the vase appeared to be in very good company. The vase to the left of it (#2304) had been known to Carnival collectors for many years as Rose and Drape, but catalogue identification had eluded collectors until the CHC catalogue arrived on the scene. Not only that, but examples of Rose and Drape were known in sizes ranging from as large as 7.5” (190mm) down to 115mm (4.5”) – a perfect size match with the new vase! The next vase along, (#2302), is also known in Carnival. If you look closely at the base and the rim, you’ll see that it is virtually a perfect match for Rose and Drape. Collectors know this pattern as Ring Around and it can be found on a huge range of items, either as the main pattern or as a simple edge decoration. There was only one more thing I needed to do before I could lay claim to a new find: present my evidence to an expert and see if they agreed. A quick flurry of messages between Glen Thistlewood and myself removed any lingering doubts. ​It was a new pattern. Above: left, three sizes of Rose and Drape, 4.5", 6" and 7.5". Right, an 8" Ring Around vase. Photos by Stephen Thistlewood. Before communicating this to other collectors, there was one more thing to do – the best part of the process. I had to give the new pattern a name. This can be as easy as finding out which name the manufacturer gave to the pattern but in this case the CHC catalogue only identified it with a pattern number. ​So, after much ‘humming and hawing’, I decided to call this Zabkowice pattern, Moda. But that’s not the end of the story. Let’s remind ourselves of the seller’s description: “An art deco vase made in the 1930s by one of the Polish glassworks HORTENSJA”. It is Polish and it certainly has an art deco look to it, but it was not made by Hortensja. So, what about the rest of that statement. Was it made in the 1930’s? And, at the risk of making myself look a little eccentric, I have to ask, is it even a vase? The CHC catalogue was published in 1949, but that is not a reliable guide to dating its contents as it’s a store catalogue, not a manufacturer’s. Currently, we don’t know how CHC acquired their stock – it could have been made to order or it could have been made up of clearance items that had been stored in warehouses for decades. There is evidence that two vase patterns (#2108 and #2109) that appear on the previous page of the CHC catalogue (shown, right) were being produced by Zabkowice in the 1920’s. Both vases featured on page 42 of the 1929 Zabkowice catalogue, ​and pattern #2108 has also been found in Carnival Glass - it is better known to collectors as Polish Panels. ​Page 42 of the 1929 Zabkowice catalogue also featured a third vase with the tantalising pattern #2301, as shown below. Above: extract from the 1929 Zabkowice catalogue. ​The next range of pattern numbers in the Zabkowice catalogue after #2301 would be the ones used for the patterns featured on page 72 of the CHC catalogue, but there is no evidence of them being used by Zabkowice before 1949. ​However, as Polish Panels was being produced up to 13 years prior to the pattern appearing in the 1949 catalogue, is it possible that Moda and its companions were in production for some time before this date? Extract from the CHC catalogue. Pattern #2108 is Polish Panels - shown below. Now that the first three patterns on Page 72 of the CHC catalogue have been identified in Carnival Glass (Ring Around, Rose and Drape, and Moda), what about the fourth one, #2308? Glen and Stephen Thistlewood's latest publication, “Carnival Glass from Europe – A to Z Encyclopedia and Pattern Guide” does have catalogue extracts from various manufacturers for a pattern called Lorna. There is no photo to compare it to, but they have had a report of a vase that matches the description that was reported in 2005 and had the type of iridescence usually associated with Sklo Union. The illustrations are all a very close match for pattern #2308, so it’s possible that this was made later using a Zabkowice mould. I’m sure it is just a matter of time before an early Carnival version is found. So, we’re left with one last question – the elephant in the room. Is my newly acquired item a vase? The quick answer is, “Yes! Of course, it’s a vase!”, but I want you to consider, for a moment, what this glass was used for in the early 20th century. A lot of glass was designed with multiple uses in mind. There were many European manufacturers who produced vases and sugar bowls that doubled up as table centre stands. Even the base of Dugan’s Storks and Rushes punch bowl can double as a vase – though it’s possible that this was not intentional. ​"serwetniki" (napkin holders) in the CHC catalogue. A 5" Pinwheel vase, made by Hortensja (photo Stephen Thistlewood). If you really wanted to impress your guests, how better than to have individual, iridescent napkin holders? I’m not suggesting for a moment that this was the case for the Moda vase, but there are many examples of ‘vases’ appearing in catalogues in the ‘Napkin Holders’ section. Even on page 25 of the CHC catalogue (above, centre) there are a handful of ‘serwetniki’, though none of them were made by Zabkowice. This small group of napkin holders could easily be used as bud vases and show that lots of manufacturers were thinking along the same lines. Pattern #’s 114, 185 and 284 all look like variations on the Pinwheel theme and were all made by different manufacturers: #114 (Krosno), #185 (Morawski) and #284 (Hortensja). 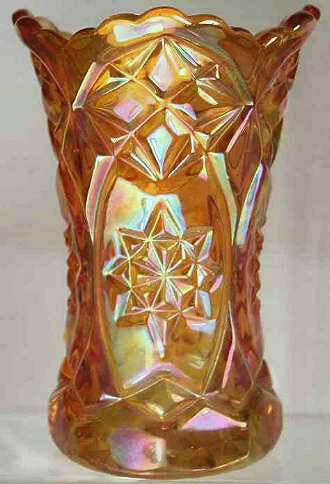 Morawski were also responsible for #167 and all three companies produced Carnival Glass. I’ve little doubt that Moda was intended to be used as a vase, but who said it couldn’t be used as a napkin holder? ​It doesn’t really matter. It’s no longer hiding somewhere waiting to be found and can finally be enjoyed for what it is: a tiny vase with a big story.